Question one on the ballot would impose stricter nurse-to-patient ratios at state hospitals. The ballot initiative would cap the number of patients a nurse can have at one time. The Massachusetts Nurses Association says if it passes, it would add much needed care. On the other side of the debate, some hospitals say while it might add nurses, it would also add costs and lead to big cuts in service. Massachusetts voters will decide on three important questions in the upcoming November election, including one that would impose stricter nurse-to-patient ratios at state hospitals. The nurses behind the effort say this is about improving patient outcomes, but on the other side, hospitals are saying this will cost patients their care. 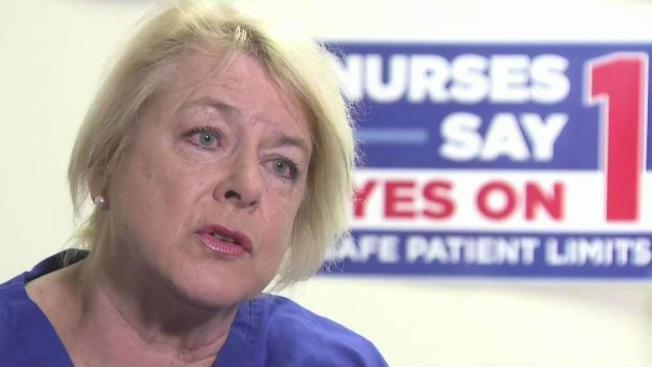 Donna Kelly-Williams, who has been a nurse for over 40 years, says asking voters to say yes to question one is about answering a longstanding complaint about staffing in hospitals. “This is the most important thing that I can do as a registered nurse to ensure that the very people that are entrusted to my care as a registered nurse are cared for the in absolute safest way possible,” Kelly-Williams said. The ballot initiative would cap the number of patients a nurse can have at one time. While it varies by department, the Massachusetts Nurses Association says it would add much needed care. But Scott Barboza, director of communications for Franciscan Children’s Hospital in Brighton, has a different take. “If it were to pass it would be devastating,” Barboza said. He says the initiative might add nurses but it would also add costs and lead to big cuts in service, especially in mental health. A new study from the state’s association of behavioural health systems says it would result in a loss of more than 1,000 behavioral health beds. “We are in the midst of a mental health paediatric crisis in this country and really when you look at the macro numbers, it’s an epidemic,” he said. But to better treat that problem in hospitals, nurses say their jobs need to change. “We can do much better and we should be doing much better,” Kelly-Williams said. A hospital like Franciscan says this would cost them about $1.6 million in added expenses, but the nurses’ union, which is backing the initiative, says it’s worth it.